A biome consists of all the habitats of a community that make up similar ecosystems in a particular region. The climate, including precipitation and temperature, and the geography control the type of biome found in a region. There are two major classifications of biomes, which are terrestial and aquatic, and these include the types of biomes known as deserts, forests, grasslands, savannas, tundra, and freshwater environments. A habitat is the location where a group of one type of organism (a population ) lives, while a biome is a community made of all the habitats in a given region and climate. Different organisms inhabit different types of biomes. Each type of biome can be found in multiple locations on Earth depending on its climate, geography, and organisms. A group of living organisms of the same kind that live in the same place simultaneously is known as a population. Populations live together in habitats, which together make up a community. An ecosystem is a community of living organisms interacting with the non-living components of that environment. A biome is a community on a global scale, where habitats flank each other, and is usually defined by the temperature, precipitation, and types of plants and animals that inhabit it. The Earth’s biomes are categorized into two major groups: terrestrial and aquatic. Terrestrial biomes are based on land, while aquatic biomes include both ocean and freshwater biomes. The major types of biomes include: aquatic, desert, forest, grassland, savannas, and tundra. Generally, biome classification is determined by the climate and geography of an area. Each biome consists of communities that have adapted to the different climate and environment inside the biome. Specifically, there are special vegetation adaptations as well as physical and behavioral adaptions made by animals in order to accommodate the environment. The eight major terrestrial biomes on Earth are each distinguished by characteristic temperatures and amount of precipitation. Comparing the annual totals of precipitation and fluctuations in precipitation from one biome to another provides clues as to the importance of abiotic factors in the distribution of biomes. Temperature variation on a daily and seasonal basis is also important for predicting the geographic distribution of the biome and the vegetation type in the biome. Earth’s Major Biomes: Each of the world’s major biomes is distinguished by characteristic temperatures and amounts of precipitation. Each type of biome can be found in multiple places. The distribution of these biomes shows that the same biome can occur in geographically distinct areas with similar climates. Biomes have no distinct boundaries. Instead, there is a transition zone called an ecotone, which contains a variety of plants and animals. For example, an ecotone might be a transition region between a grassland and a desert, with species from both. Tropical wet forests are characterized by high precipitation and humidity, while savannas have scattered trees and an extensive dry season. Tropical wet forests, located near the equator, have temperatures that range from 20°C – 34°C (68°F – 93°F), with little variation in seasonal temperatures. The lack of seasonality, constant daily sunlight, ideal temperatures, and high rate of precipitation in tropical wet forests lead to increased plant growth and high species diversity. The annual rainfall in tropical wet forests ranges from 125 to 660 cm (50–200 in); there is a high rate of precipitation even in the dry months. Savannas, grasslands with scattered trees, are located in Africa, South America, and northern Australia. Temperatures in savannas range from 24°C – 29°C (75°F – 84°F), with annual rainfall ranges from 10–40 cm (3.9–15.7 in). Because savannas are very dry, trees do not grow as well as they do in other forest biomes and diversity is minimal. Tropical wet forests, also referred to as tropical rainforests, are found in equatorial regions. The vegetation is characterized by plants with broad leaves that fall off throughout the year. 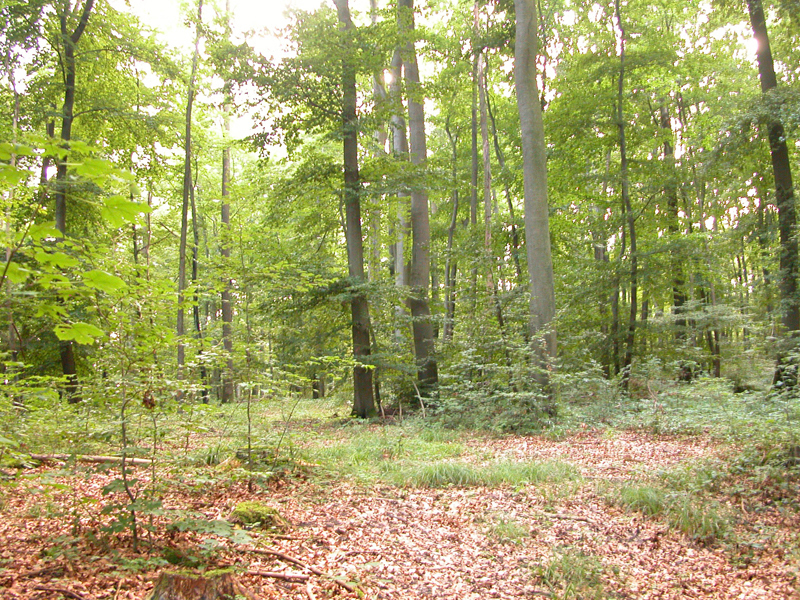 Unlike the trees of deciduous forests, the trees in this biome do not have a seasonal loss of leaves associated with variations in temperature and sunlight; these forests are “evergreen” year-round. Terrestrial biomes: Each of the world’s major biomes is distinguished by characteristic temperatures and amounts of precipitation. Polar ice and mountains are also shown. Tropical wet forests are depicted in green and are usually found at equatorial regions. Savannas are depicted in light pink and are usually located in Africa, South America, and Northern Australia. The temperature and sunlight profiles of tropical wet forests are very stable in comparison to that of other terrestrial biomes, with the temperatures ranging from 20°C – 34°C (68°F – 93°F). Compared to other forest biomes, tropical wet forests have little variation in seasonal temperatures. This lack of seasonality leads to year-round plant growth, rather than the seasonal (spring, summer, and fall) growth seen in other biomes. In contrast to other ecosystems, tropical ecosystems do not have long days and short days during the yearly cycle. Instead, a constant daily amount of sunlight (11–12 hrs per day) provides more solar radiation and, thereby, a longer period of time for plant growth. The annual rainfall in tropical wet forests ranges from 125-660 cm (50–200 in), with some monthly variation. While sunlight and temperature remain fairly consistent, annual rainfall is highly variable. Tropical wet forests have wet months in which there can be more than 30 cm (11–12 in) of precipitation, as well as dry months in which there are fewer than 10 cm (3.5 in) of rainfall. However, the driest month of a tropical wet forest still exceeds the annual rainfall of some other biomes, such as deserts. Tropical wet forests have high net primary productivity because the annual temperatures and precipitation values in these areas are ideal for plant growth. Therefore, the extensive biomass present in the tropical wet forest leads to plant communities with very high species diversity. Tropical wet forests have more species of trees than any other biome. On average, between 100 and 300 species of trees are present in a single hectare (2.5 acres) of South America. One way to visualize this is to compare the distinctive horizontal layers within the tropical wet forest biome. On the forest floor is a sparse layer of plants and decaying plant matter. Above that is an understory of short shrubby foliage. A layer of trees rising above this understory is topped by a closed upper canopy: the uppermost overhead layer of branches and leaves. Some additional trees emerge through this closed upper canopy. These layers provide diverse and complex habitats for the variety of plants, fungi, animals, and other organisms within the tropical wet forests. For instance, epiphytes are plants that grow on other plants. Host plants are typically unharmed. Epiphytes are found throughout tropical wet forest biomes. Many species of animals use the variety of plants and the complex structure of the tropical wet forests for food and shelter. Some organisms live several meters above ground, having adapted to this arboreal lifestyle. 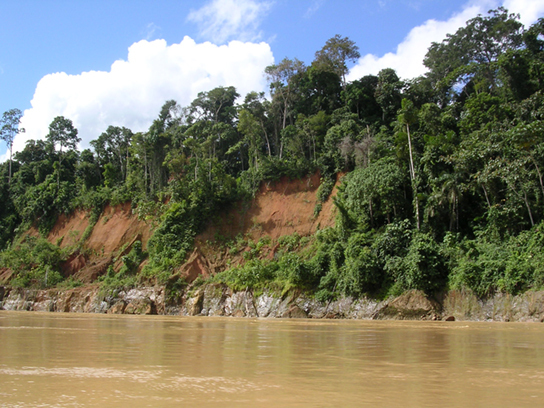 Tropical wet forests: Tropical wet forests, such as the forests of Madre de Dios near the Amazon River in Peru, have high species diversity. Savannas are grasslands with scattered trees located in Africa, South America, and northern Australia. Savannas are hot, tropical areas with temperatures averaging from 24°C – 29°C (75°F – 84°F) and an annual rainfall of 10–40 cm (3.9–15.7 in). They have an extensive dry season. For this reason, forest trees do not grow as well as they do in the tropical wet forest or other forest biomes. As a result, there are relatively few trees within the grasses and forbs (herbaceous flowering plants) that dominate the savanna. Since fire is an important source of disturbance in this biome, plants have evolved well-developed root systems that allow them to quickly re-sprout after a fire. 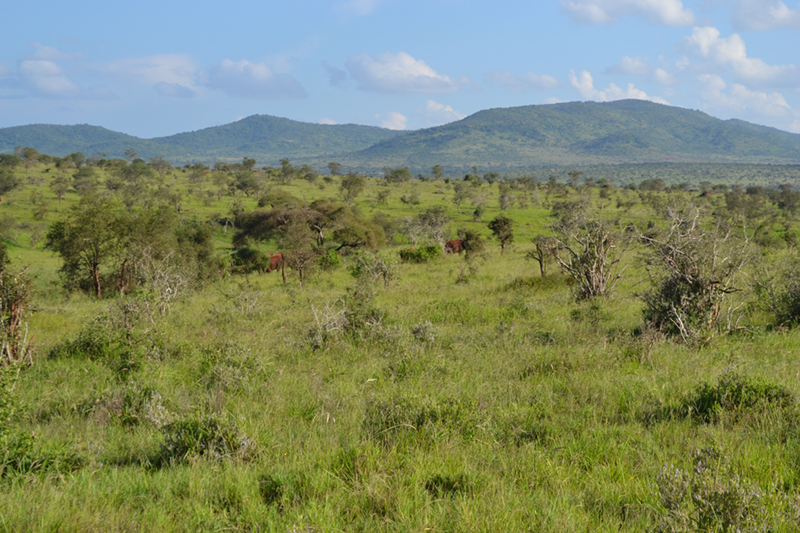 Savannas: Savannas, such as this one in Taita Hills Wildlife Sanctuary in Kenya, are dominated by grasses. Animals commonly found in savannas in Africa include the African elephant, lions, gazelles, giraffes, ostriches, and many other mammals, birds, plants and invertebrates. The northern Australian savannas also have many types of plants, animals, insects, and reptiles, including marsupials (kangaroos and wallabies), bats, and rodents. In addition to the native animals such as foxes and Patagonian maras (rabbit-like rodents), savannas in South America are commonly used for grazing domestic livestock, such as sheep, goats, and cattle because of their open grasslands and herbaceous layer of plants. Subtropical deserts are characterized by their dry environments, while chaparrals are characterized by the presence of shrubs. Subtropical deserts are centered on the Tropics of Cancer and Capricorn. Subtropical deserts can be hot or cold, but they are all very dry,having very low annual precipitation. Because precipitation is so low in subtropical deserts, most plants are annuals which utilize adaptations to conserve water. Chaparrals (scrub forests) are found in California, along the Mediterranean Sea, and along the southern coast of Australia. Chaparrals are very wet in the winter, but very dry in the summer months; most chaparral plants stay dormant during the summer. Most chaparral plants are shrubs adapted to fires; some seeds only germinate after a fire. Subtropical deserts, which exist between 15° and 30° north and south latitude, are centered on the Tropics of Cancer and Capricorn. In some years, evaporation exceeds precipitation in this very dry biome. Subtropical hot deserts may have daytime soil surface temperatures above 60°C (140°F) and nighttime temperatures approaching 0°C (32°F). In cold deserts, temperatures may be as high as 25°C (77°F) and may drop below -30°C (-22°F). Subtropical deserts are characterized by low annual precipitation of fewer than 30 cm (12 in), with little monthly variation and lack of predictability in rainfall. In some cases, the annual rainfall can be as low as 2 cm (0.8 in), such as in central Australia (“the Outback”) and northern Africa. There are several types of deserts including high-pressure deserts, mid-continent deserts, rain-shadow deserts, and upwelling deserts. In high-pressure deserts, the high atmospheric pressure enables the air to retain more moisture and there is little rainfall. High-pressure deserts include the Sahara, Arabian, Thar, and Kalahari deserts, and the desert regions within the Arctic and Antarctic circles. Areas in the middle of a continent can receive little rainfall because moisture tends to condense before it reaches the middle of a large continent. Modern examples of mid-continent deserts are the Turkmenistan, Gobi, and Great Australian deserts. Third, rain-shadow deserts are created when moisture from the ocean condenses on one side of a mountain range. These mountain ranges usually have a rainforest on one side and a desert on the other. Examples of rain-shadow deserts include the Mojave desert in the rain-shadow of the Sierra Nevada, the Patagonian desert in the rain-shadow of the Andes, and the Iranian desert in the rain-shadow of the Zagros mountains. Finally, upwelling deserts exist adjacent to areas where cold currents rise to the ocean surface, reducing evaporation. Examples include the Atacama desert, the Western Sahara, and the Namib desert. The type of vegetation and limited animal diversity of this biome are closely related to the low and unpredictable precipitation. Very dry deserts lack perennial vegetation that lives from one year to the next. Instead, many plants are annuals that grow quickly, reproduce when rainfall does occur, and then die. Many other plants in these areas are characterized by having a number of adaptations that conserve water, such as deep roots, reduced foliage, and water-storing stems. Seed plants in the desert produce seeds that can remain in dormancy for extended periods between rains. To reduce water loss and conserve energy, many desert animals like the fennec fox are nocturnal and burrow during the day. Fennec fox: Fennec foxes live in the deserts of Northern Africa and have large ears for heat dissipation during the day. They stay in burrows during the day and are mostly active at night. 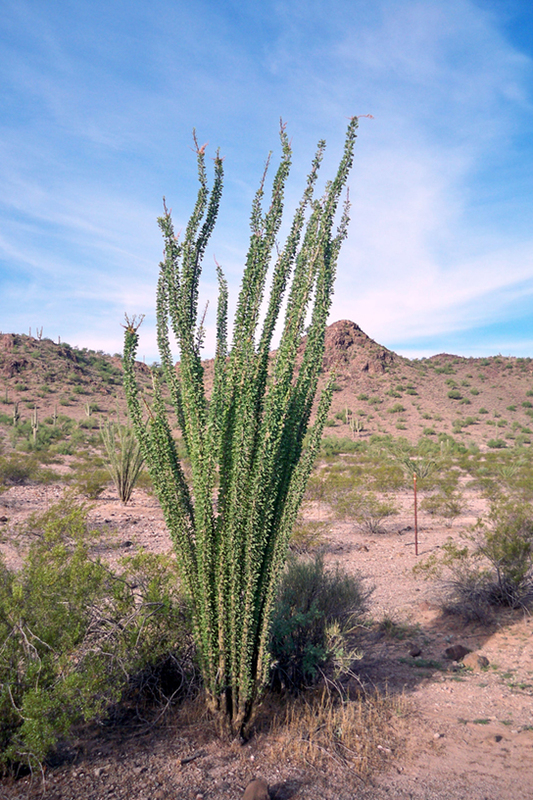 Desert plants: To reduce water loss, many desert plants have tiny leaves or no leaves at all. The leaves of ocotillo (Fouquieria splendens), shown here in the Sonora Desert near Gila Bend, Arizona, appear only after rainfall and then are shed. The chaparral, also called the scrub forest, is found in California, along the Mediterranean Sea, and along the southern coast of Australia. The annual rainfall in this biome ranges from 65 cm to 75 cm (25.6–29.5 in), with the majority of rain falling in the winter. 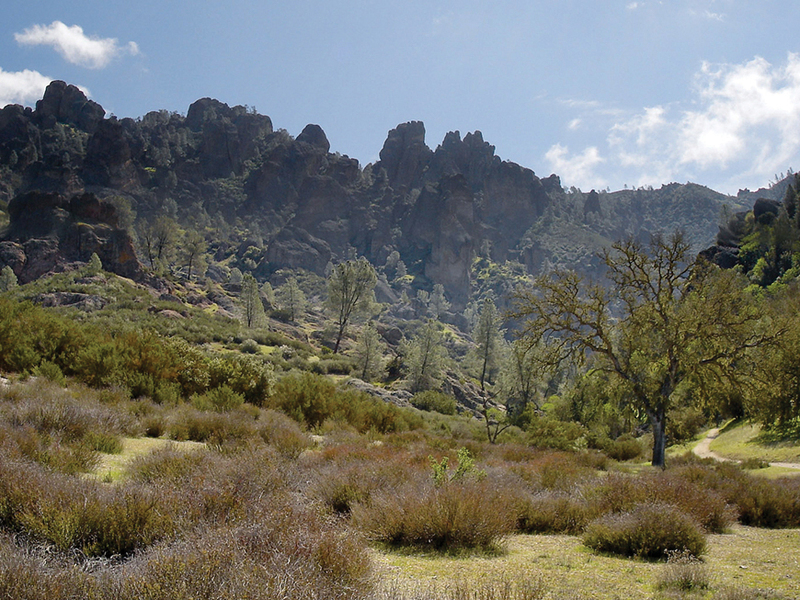 Due to the very dry summers, many chaparral plants are dormant during that season. The chaparral vegetation is dominated by shrubs and is adapted to periodic fires, with some plants producing seeds that only germinate after a hot fire. The ashes left behind after a fire are rich in nutrients, such as nitrogen, that fertilize the soil and promote plant regrowth. Chaparrals: The chaparral, or scrub forest, is dominated by shrubs adapted to periodic fires. Some plants produce seeds that only germinate after a hot fire. Temperate grasslands are areas with low annual precipitation, fluctuating seasonal temperatures, and few trees. Temperate grasslands are found throughout central North America, where they are also known as prairies; they are also found in Eurasia, where they are known as steppes. Temperate grasslands have hot summers and cold winters; the growing season occurs during the spring, summer, and fall. Because of the low annual precipitation, temperate grasslands have very few trees. Grasses are the dominant vegetation; their roots and rhizomes provide increased fertility to the soil. Fires caused by lightening occur often in grasslands; without fires grasslands are converted to scrub forests. Temperate grasslands are found throughout central North America, where they are also known as prairies, and within Eurasia, where they are known as steppes. Temperate grasslands have pronounced annual fluctuations in temperature, with hot summers and cold winters. The annual temperature variation produces specific growing seasons for plants. Plant growth is possible when temperatures are warm enough and when ample water is available to sustain it, which typically occurs in the spring, summer, and fall. During much of the winter, temperatures are low and water, which is stored in the form of ice, is not available for plant growth. Temperate grasslands in New Zealand: Temperate tussock grasslands form expansive and distinctive landscapes in the South Island and to a lesser extent in the central plateau region of the North Island of New Zealand. Annual precipitation ranges from 25 cm to 75 cm (9.8–29.5 in). Because of relatively-lower annual precipitation in temperate grasslands, there are few trees, except for those found growing along rivers or streams. The dominant vegetation tends to consist of grasses; some prairies sustain populations of grazing animals. The vegetation is very dense and the soils are fertile because the subsurface of the soil is packed with the roots and rhizomes (underground stems) of these grasses, which anchor plants into the ground and replenish the organic material (humus) in the soil when they die and decay. Przewalski’s horses on the Asian steppes: The Przewalski’s horse is a rare and endangered subspecies of wild horse. By the end of the 1950s, only 12 individual Przewalski’s horses were left in the world and several reintroduction programs have released populations back into the grasslands in Mongolia and Ukraine. Fires, mainly caused by lightning, are a natural disturbance in temperate grasslands. When fire is suppressed, the vegetation eventually converts to scrub and dense forests. Often, the restoration or management of temperate grasslands requires the use of controlled burns to suppress the growth of trees and maintain the grasses. Burning causes new grass to grow, which brings back the grazing animals. Mites, insect larvae, nematodes and earthworms inhabit deep soil, which can reach 6 meters (20 ft) underground in undisturbed grasslands on the richest soils of the world. These invertebrates, along with symbiotic fungi, extend the root systems, break apart hard soil, enrich it with urea and other natural fertilizers, trap minerals and water, and promote growth. Some types of fungi make the plants more resistant to insect and microbial attacks. Grasslands also are home to a vast variety of mammals, reptiles, birds, and insects. Typical large mammals include the Giant Anteater and populations of grazing animals, such as the Blue Wildebeest, Przewalski’s Horse, and the American Bison. 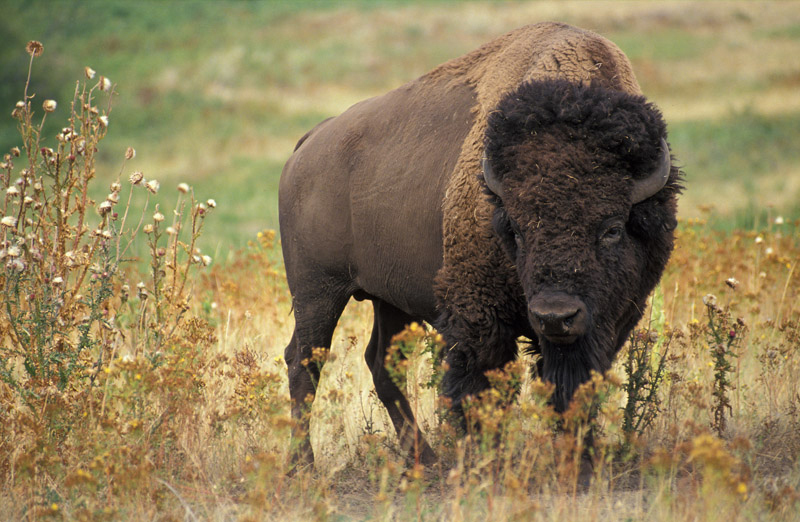 Grazing animals: The American bison (Bison bison), more commonly called the buffalo, is a grazing mammal that once populated American prairies in huge numbers. Temperate forests are characterized by fluctuating seasonal temperatures and constant-but-moderate rainfall. Temperate forests are the most common biome in eastern North America, Western Europe, Eastern Asia, Chile, and New Zealand. Temperatures in temperate forests fluctuate; there are defined growing seasons during spring, summer, and early fall. Because temperate forests have moderate annual precipitation, the dominant plants are the deciduous trees. Deciduous trees experience a dormant period in the winter, which is why temperate forests have less net productivity than tropical forests. Temperate forests are more open than tropical wet forests since their trees do not grow as tall. The soils of the temperate forests are rich in inorganic and organic nutrients; this is due to the thick layer of leaf litter on forest floors, which returns nutrients to the soil. Temperate forests are the most common biome in eastern North America, Western Europe, Eastern Asia, Chile, and New Zealand. This biome is found throughout mid-latitude regions. Temperatures ranging between -30°C – 30°C (-22°F – 86°F) drop below freezing on an annual basis, resulting in defined growing seasons during the spring, summer, and early fall. Precipitation is relatively constant throughout the year, ranging between 75 cm and 150 cm (29.5–59 in). Because of the moderate, annual rainfall and temperatures, deciduous trees are the dominant plant in this biome. Deciduous trees lose their leaves each fall, remaining leafless in the winter; thus, no photosynthesis occurs during the dormant winter period. Each spring, new leaves appear as the temperature increases. Because of the dormant period, the net primary productivity of temperate forests is less than that of tropical wet forests. In addition, temperate forests show less diversity of tree species than do tropical wet forest biomes. Deciduous trees: Deciduous trees, those that lose their leaves seasonally, are the dominant plant in the temperate forest. The trees of the temperate forests leaf out and shade much of the ground; however, this biome is more open than tropical wet forests because trees in the temperate forests do not grow as tall as the trees in tropical wet forests. The soils of the temperate forests are rich in inorganic and organic nutrients due to the thick layer of leaf litter on forest floors. As this leaf litter decays, nutrients are returned to the soil. The leaf litter also protects soil from erosion, insulates the ground, and provides habitats for invertebrates (such as the pill bug or roly-poly, Armadillidium vulgare) and their predators, such as the red-backed salamander (Plethodon cinereus). The leaf litter is home to invertebrates (such as the pill bug or roly-poly, Armadillidium vulgare) and their predators, including the red-backed salamander (Plethodon cinereus). Pileated woodpeckers depend upon dead or dying trees as a source of food and for constructing their nests, and many migratory birds, such as the spring warblers, time their arrival to coincide with the opening of the tree canopy, which provides the insects that are their principal food sources for raising young. Many well-known animals are found in temperate deciduous forests including squirrels, deer, and bears. The top predators in deciduous forest were once wolves and cougars, but their populations have been in decline. White-tailed deer: Deer such as the white-tailed deer of North America are common inhabitants of temperate forests. 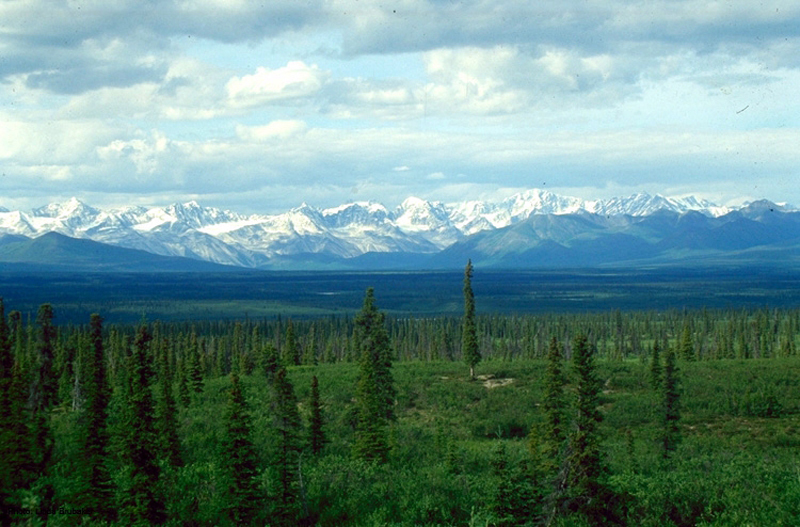 The boreal forest is characterized by coniferous trees, while the arctic tundra is characterized by permanently frozen soils. The boreal forest is found across most of Canada, Alaska, Russia, and northern Europe; the arctic tundra lies north of the boreal forest. The boreal forest has cold, dry winters and short, cool, wet summers with precipitation that takes the form of snow; due to this environment, evergreen coniferous trees are the dominant plants. The soil in boreal forest regions is usually acidic and contains little available nitrogen. Boreal forests have lower productivity than tropical or temperate forests; they also have less diversity, with only a tree layer and ground layer. Temperatures in the arctic tundra are cold year-round and precipitation is very low. Plants in the arctic tundra have a very short growing season of approximately 10–12 weeks, but during this time, growth is rapid; plants are low to the ground and the soil is permanently frozen. The boreal forest, also known as taiga or coniferous forest, the world’s largest terrestrial biome, is found south of the Arctic Circle and across most of Canada, Alaska, Russia, and northern Europe. This biome has cold, dry winters and short, cool, wet summers. Temperatures vary from −54°C – 30°C (-65°F – 86°F) throughout the whole year. The summers, while short, are generally warm and humid. In much of the taiga, -20°C (-4°F) would be a typical winter day temperature, while 18°C (64°F) would be an average summer day.The annual precipitation, from 40 cm -100 cm (15.7–39 in), usually takes the form of snow. Little evaporation occurs because of the cold temperatures. The long and cold winters in the boreal forest have led to the predominance of cold-tolerant, cone-bearing plants. These are evergreen, coniferous trees such as pines, spruces, and firs, which retain their needle-shaped leaves year-round. Evergreen trees can photosynthesize earlier in the spring than can deciduous trees because less energy from the sun is required to warm a needle-like leaf than a broad leaf. This benefits evergreen trees, which grow faster than deciduous trees in the boreal forest. In addition, soils in boreal forest regions tend to be acidic, with little available nitrogen. Leaves are a nitrogen-rich structure that deciduous trees must produce yearly. Therefore, coniferous trees that retain nitrogen-rich needles may have a competitive advantage over the broad-leafed deciduous trees. The net primary productivity of boreal forests is lower than that of temperate forests and tropical wet forests. The aboveground biomass of boreal forests is high because these slow-growing tree species are long-lived, accumulating standing biomass over time. Plant species diversity is less than that seen in temperate forests and tropical wet forests. Boreal forests lack the pronounced elements of the layered forest structure seen in tropical wet forests. The structure of a boreal forest is often only a tree layer and a ground layer. When conifer needles are dropped, they decompose more slowly than do broad leaves; therefore, fewer nutrients are returned to the soil to fuel plant growth. Plants in the boreal forest: The boreal forest (taiga) has low-lying plants and conifer trees; it often consists of only a tree layer and a ground layer. The Arctic tundra, lying north of the subarctic boreal forest, is located throughout the Arctic regions of the northern hemisphere. The average winter temperature is -34°C (-29.2°F), while the average summer temperature is from 3°C – 12°C (37°F – 52°F). Plants in the arctic tundra have a very short growing season of approximately 10–12 weeks. However, during this time, there are almost 24 hours of daylight, so plant growth is rapid. The annual precipitation of the Arctic tundra is very low (about 15-25 cm), with little annual variation in precipitation. As in the boreal forests, there is little evaporation due to the cold temperatures. 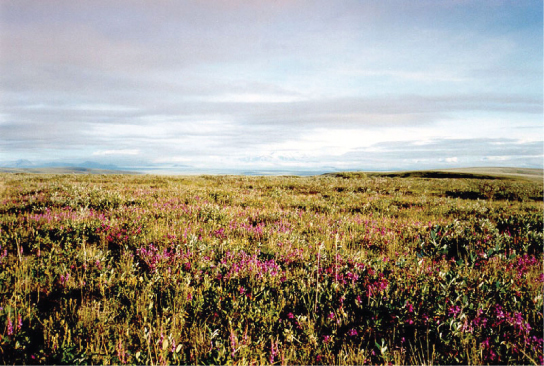 Plants in the Arctic tundra are generally low to the ground. There is little species diversity, low net primary productivity, and low aboveground biomass. The soils of the Arctic tundra may remain in a perennially frozen state referred to as permafrost. The permafrost makes it impossible for roots to penetrate deep into the soil and slows the decay of organic matter, which inhibits the release of nutrients from organic matter. During the growing season, the ground of the Arctic tundra can be completely covered with plants or lichens. Plants in the Arctic tundra: Low-growing plants such as shrub willow dominate the tundra landscape, shown here in the Arctic National Wildlife Refuge. The biodiversity of the tundras is low: there are 1,700 species of vascular plants and only 48 species of land mammals. Notable animals in the Arctic tundra include caribou (reindeer ), musk ox, arctic hare, arctic fox, snowy owl, lemmings, and polar bears. Due to the harsh climate, tundra regions have seen little human activity, even though they are sometimes rich in natural resources such as oil and uranium. Caribou (reindeer) in the tundra: Some populations of the North American caribou migrate the farthest of any terrestrial mammal, traveling up to 5,000 km (3,100 mi) a year.